Facebook’s (s fb) decision a year ago to focus on mobile — which will be evident at tomorrow’s F8 conference in San Francisco — makes more sense when you see how much of an impact it has on the way users engage with content via their smartphones. 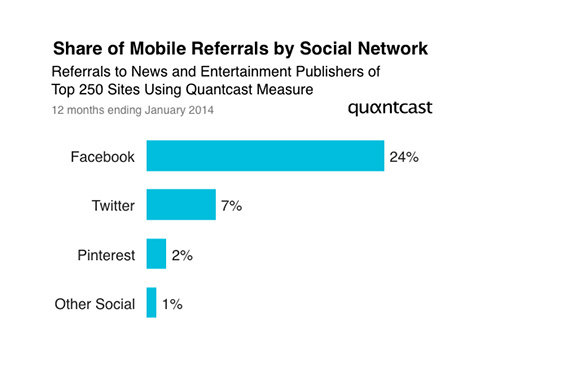 According to a blog post from Quantcast, Facebook is responsible for more “content discovery” mobile referrals (i.e. referrals to news and other media) than any other social network combined. Studying the referral traffic to the top 250 news and entertainment publishers, Facebook represents 24 percent of those mobile referrals — more than three times that of Twitter and twelve times that of Pinterest. And, when users click on a link within Facebook’s app, they tend to stay there: Quantcast found that Facebook’s in-app browser, which pops up after clicking a third-party link, is responsible for 12 percent of iOS browsing (s aapl). That figure makes it the leading third-party browser for iOS, and three times larger than Chrome for iOS. Facebook’s mobile strategy has prioritized content consumption on-the-go. As a result, Facebook has crafted a recipe that not only allows users to engage with content they want to click on, but also serves that content without leaving the app.